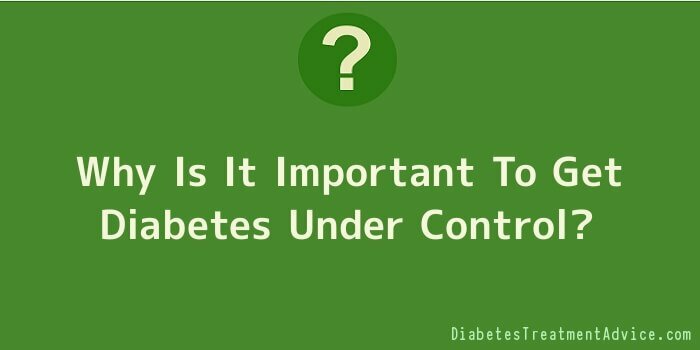 Why Is It Important To Get Diabetes Under Control? Most diseases cause pain or physical disability of some sort. Diabetes, however, can go for years before the signs and symptoms are significant enough to convince the patient that they must bring their diabetes under control. It is said to be a silent killer, because anyone can have a heart attack with no notice—and failing to get diabetes under control is almost a guarantee that it will happen at some point. Many people have a great deal of difficulty getting diabetes under control. Some don’t take it seriously, some are in denial, and some don’t care. Whether or not they are putting in a solid effort to control the disease, they need to do their best to get everything in line before we start experiencing the minor symptoms of the disease. If frequent lectures from a doctor about dying early or the risk of a heart attack don’t work, or if viewing TV diagnosis specials where patients lose limb after limb due to gangrene, you can’t convince someone that doesn’t want to hear it. However, once they experience aches and pains, frequent urination, intense thirst, headaches, pain in the feet and other extremities (from nerve damage), tooth problems that turn into abscesses, and frequent and painful yeast infections, they may be more likely to listen. Any of these symptoms may push a patient into the realization that they need to get their diabetes under control and do it now. Diabetes Under Control—Is It Worth It? The results may not be immediate, but it is definitely worth the effort to get diabetes under control. Whether it’s adding 15 years to your lifespan, avoiding a heart attack, or just relieving of the pain of semi-monthly yeast infections, the outcome is worth it. It is, however, an ongoing process of getting and keeping diabetes under control. The body’s ability to handle and produce insulin changes, blood sugars fluctuate, and sickness or infection plays havoc with glucose production. Not following a diet or exercising habits, or taking medication as necessary, can make the difference between diabetes under control and diabetes out of control. Letting go of a routing for as little as two weeks can make a major difference in the affect of the disease. Since it sometimes takes two weeks or longer for medication to begin working, missing two weeks can set you back four weeks in your program.